Big young ruckman from Rutherglen in country Victoria who worked his way from the Hawthorn rookie list in 2001 onto the senior list for season 2002. Campbell made his debut due to a chronic shortage of ruckmen, and proved to be handy in the centre bounces and around the ground. He suffered a broken collarbone at training, which robbed him of chances to play seniors in the closing rounds of 2002, and the arrival of Peter Everitt further limited his senior opportunities throughout 2003. The departure of David Loats created an opportunity for Campbell to establish himself as a second ruckman behind Everitt, but he never really did enough in 2004. His 2005 season was ruined by injury, but he bounced back magnficently in 2006, taking on a key defensive role at times but also improving his ruckwork out of sight. 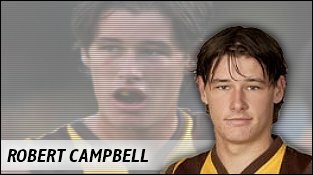 With the departure of Everitt, Campbell took the mantle of number 1 ruckman and was more than solid playing every game in 2007.